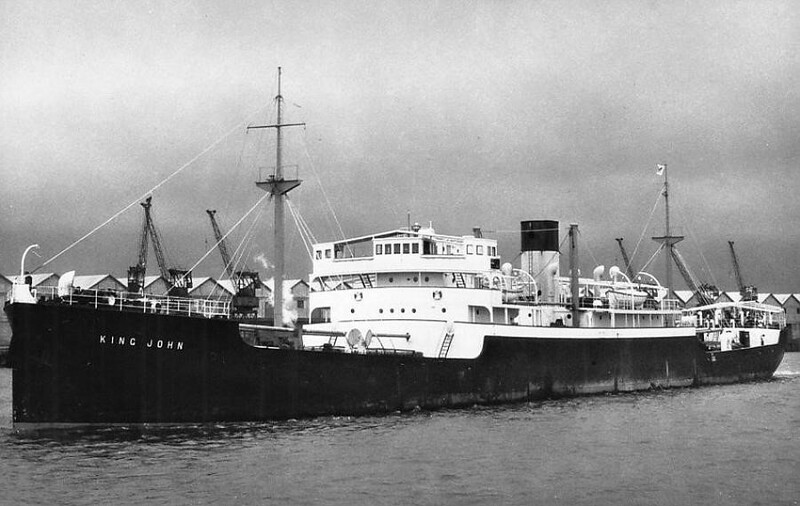 13th July 1940 sunk by gunfire from German raider Widder. The War Illustrated, Volume 3, No. 56, Page 333, September 27, 1940. Among the merchant ships waylaid and sunk by a disguised German raider operating off the West Indies was the 5,000-ton "King John" of Liverpool. The ship's carpenter, Mr. Burroughs, here tells how his ship was sunk and the crew's four days in an open boat. We all had a look at it when it came nearer, because ninety per cent of the ships on the seas these days seem to be British. But this one was a foreigner. The cabinboy next to me asked if she was carrying a gun, but all I could see was something square at the stern of the ship. It was one of four hidden six-inch guns. The raider was flying the Swedish flag, and had Swedish colours painted on her sides. All of a sudden she opened fire. Four shells burst around us, sending red-hot, jagged shrapnel flying everywhere. Then there was another salvo of shells and another. With our one small gun we had no chance of fighting back. The raider had come up on us, innocently, had carefully fixed her gun slights and was firing at point-blank range. A young Australian was at our gun, stripped to the waist, but he couldn't do anything. If he had fired back, he might have won fame for himself, but we should all have been blown to kingdom come. The captain gave the order to abandon ship. I ran to my quarters, grabbed some tobacco, and put my best suit under my arm. Then I stopped to get a quick drink from the pump – because I guessed rightly that we might soon be suffering from thirst in an open boat – and I dropped my best trousers, not once worn, and lost them. They were still firing as we lowered the boat. There were nineteen in my boat and forty-one in the boat on the other side of the ship. When we were nearly two miles away a motor-launch from the German ship fired a machine-gun across our bows to make us stop. As they approached one of the officers shouted "Hands up". They took our captain and chief engineer on board to be prisoners in the raider, and then they looked us over for souvenirs. One of the junior radio men had his savings of £25 in a cashbox on his lap. They took that. They took a sheath-knife from me. Both our lifeboats were brought alongside the raider, and the Germans launched a third one, containing prisoners they had taken off the "Davisian", another British ship they had sunk just before us. The "Davisian's" crew were amused about the way the Germans favoured the Scotsmen aboard. The Nazis seemed to have the idea that Scotland was only waiting the right moment to rebel against England, so they gave the Scotsmen a ration of cigarettes, and none to the Englishmen, so as to spread discontent! We cast off in our lifeboat, hoisted the sails, and soon lost sight of the other boats. Luckily for us our captain had whispered to us the course we should follow just before the Germans came alongside. His reckoning was dead right, though it took us four days and four nights to get to the island he had told us about. The sun beat down on us during those four long days. The skin peeled off our face and arms, and our lips were cracked. We were rationed to a beakerful of water a day per man, and some of the men were getting desperate with thirst when the clouds broke and the rain came. We all opened our mouths to the sky, and sucked the water off our arms.